Our new series, Audience Spotlight, provides a cross-device, consumer-centric view on a specific audience, with a deep dive into user demographics and rich behavioral metrics on an audience segment. 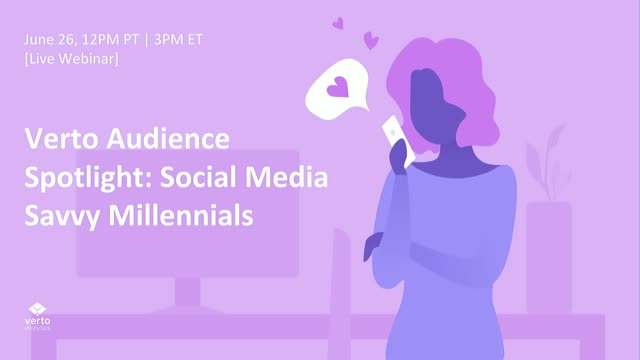 This month we focus on a high-value audience - Social Media Savvy Millennials, users between the ages of 18-35 who comprise the top 20% of all digital consumers based on the amount of time they spend on social media apps and sites. Attend the webinar and learn which screens, brands, and services attract these social media superusers. - How do the gender and household income distribution of Millennials stack up against the U.S. adult online population? - Which devices and apps are Social Media Savvy Millennials using and when? - Beyond Facebook, YouTube, and Snapchat, where else do Social Media Savvy Millennials spend their time? Aaron Schwartz, Senior Data Analyst / Verto Analytics Inc.
What happens after a Smartphone is unlocked? By default, an app is relaunched. Do some apps get relaunched more than others? What are the apps that best capture a user’s attention when launched by unlock? How effective are push notifications? How does being the first app seen after unlock matter considering today’s casual media consumption behavioral trends? In this 60 minute live webinar, Verto will use its proprietary single-source panel to provide an in-depth analysis on the mobile unlock journey and showcase metrics and analytics that help understand the impact of the first app seen after unlock. Additionally, we will get insight from one of the leading apps when it comes to user engagement after unlock. Our new series, Audience Spotlight, provides a cross-device, consumer-centric view on a specific audience, with a deep dive into user demographics and rich behavioral metrics on an audience segment. This month, we focus on a high-value audience - Shopaholics, users who comprise the top 20% of all U.S adults who access an online shopping property. Which screens, brands, and services attract these online shopping superusers? - How do gender and household income distribution of Shopaholics stack up against the U.S. adult online population? - Which devices and apps are Shopaholics using and when? - Beyond Amazon, eBay, and Walmart, where else do Shopaholics spend their time? Our new series, Audience Spotlight, provide a cross-device, consumer-centric view on a specific audience, with a deep dive into user demographics and rich behavioral metrics on an audience segment. This month, we focus on a high value audience - heavy users of games on PCs, tablets, and smartphones, whom we refer to as Heavy Gamers. Learn the ins and outs of this demographic and how Verto data can be used to gain a deeper understanding of your audience. Who are heavy gamers, which devices do they use, and what does a day in their digital life look like? The stickiest and top-ranking games and apps among this audience segment. What other types of digital content heavy gamers spend their time on. More than 96% of all American adults engage with an e-commerce property at least once a month. * Consumers use a variety of devices to research, shop, and complete their purchases. To understand today’s digital shopper, it’s imperative to look at the full funnel view, the path before and after purchase, on multiple screens. - What does the shopper funnel view look like? See which properties are visited most before or after shopping, including day-in-the-life and week-in-the-life views of key demographics. - Who is the online shopper? How often do different demographics shop, how much time do they spend shopping, and when do they shop? How are online shopping behaviors different depending on demographics? - How do consumers behave differently with different shopping platforms? Understand how Macy's, Groupon, Wish, Target, Google, and Amazon consumers interact when they’re shopping. - How does multitasking play a part in shopping? Understand the other apps consumers are using while shopping, which may influence their purchase decision. Learn how Verto Analytics uses single-source panel data to provide the latest in digital shopping analysis. Register today. * Source: Verto Analytics data from December 2017. Competition for a consumer’s attention is fierce. Verto Analytics data shows that the average American adult now owns 5 devices and spends nearly 220 hours per month online. Knowing how much time consumers spend with the competition, and why, can uncover new insights that can make a real impact on your business. Learn how to use Verto Watch data to develop a plan to outsmart your competitors and develop informed strategies for your company - from R&D to product to marketing and beyond. Publishers are drowning in data, but don’t always know what to do with it. Without the right metrics to show a highly engaged and loyal audience, publishers risk losing to dominant players who win purely on reach. Audience data is a powerful tool that can help publishers tell a better story about their customers and win more advertising business. Does the rise of AI-driven personal assistant apps - led by Siri, Alexa, and Cortana - have the potential to impact our daily digital behavior with everyday tasks like shopping, browsing the internet, and discover content? In this webinar, we’ll look at new research that indicates where this market is headed. - The most popular AI-powered personal assistant apps. - How are consumers actually using personal assistant apps? - A day-in-the-life of a Personal Assistant App super user. Consumer media consumption has changed dramatically. The average consumer owns and uses as many as five devices, making multitasking the “new normal.” That’s why most publishers say that traditional, siloed audience measurement no longer meets their needs. - The major challenges of audience measurement and how advancements in research methodology can help you overcome them. - How to use a "day-in the-life" visualization to illustrate who your audience is and where they spend time down to the minute and hour. - The key cross-device metrics that explain the exact reach of your audience and how they’re engaging with you across all of your brands and channels. - How to use insights and unique metrics like stickiness or time spent to demonstrate how your audience differs from your competitors. Attention brands, publishers, and advertisers: Wondering how and when to capture consumer attention? Attend this webinar to get a review of our latest data and insights about the U.S. cross-device and mobile consumer. - How are consumers using various devices over the course of a week, and which demographic segments are the most cross-device? - Which social and content apps rank high and for whom? Status Quo Marketers hold on to a bygone era of advertising by flooding the market with cross-channel promotions and messaging in the hopes of grabbing an individual’s attention. They struggle to absorb, and maybe, ignore critical facts about how consumer behavior has changed. Connected Marketers, on the other hand, understand that grabbing a person's attention involves a value exchange. These marketers use insights and data to learn when and where to reach the individual and how to meet her needs, on her terms. With the explosion of digital channels, content, and devices, a consumer’s path-to-purchase becomes more convoluted as she researches, browses, compares brands across screens and using apps and sites. Brands and retailers are still in the dark about some important aspects of the consumer’s journey. To keep pace with consumers, it's important to measure not only what they do but why they do it. In this webinar we examine how leading brands have used behavioral data and survey research to improve a myriad of outcomes, from brand engagement to conversions. Competing for a single consumer’s attention across an average of five screens is a daunting task. But tackling this challenge may not be so difficult if you have a nuanced understanding of how consumers behave across the devices they own and the apps, sites, and services they use. Whether you’re a large brand or a mobile app publisher, nothing is more important than understanding what your target consumer does, why, and what she might do next. In this webinar, learn how Verto Analytics brings a blend of technology, scale, speed, and research expertise to the market using surveys and passive metering to provide a more accurate picture of the consumer. Mobile app audience acquisition is a $10 billion business and growing. But what every brand and advertiser should know is that regardless of app category, only 10% - 20% of mobile app users remain post-download. And these loyal users drive between 75% - 100% of app revenue. Attend this on-demand webinar to delve into the economics and behaviors of the high-value mobile app user. - Which app categories tend to attract the most downloads and retain active users? - What are the demographics of loyal, active users across these various app categories? - What is the projected value of a retained active user? With mobile app advertising driving more than half of the revenue growth in digital advertising, evaluating ROI on spend has never been more important. In this session, Verto Analytics’ VP, Client Solutions, Laura Grover, will present a new framework for mobile app advertising which measures the conversion between installs and long-term user activity to measure monetization opportunities within the mobile app space. - Who are the major players in mobile app advertising today, and how do the economics work? - Why is the industry standard measurement for ROI lacking? - How can mobile app publishers and advertisers keep better tabs on their spend and improve financial outcomes? Attracting users and keeping them engaged well past download is a great challenge for most mobile app developers, publishers and marketers. But nowhere is the challenge — and the opportunity — greater than in mobile games. In an industry where there is no dominant player and lots of potential upside, every game publisher is fighting for user attention. Verto Analytics provides a consumer-centric measurement solution for monitoring the complex behavior of today’s consumer on every device, app, and platform they use throughout the day. We provide data and insights that inform marketing, competitive intelligence, media buying, product strategy and development. Presented by: Aaron Schwartz, Senior Data Analyst / Verto Analytics Inc.